For those of you that were intrigued with the photos of the apparition taken during the October 2009 Ghost Walk, here is one more. Luckily our friends at Girls/Guys Paranormal Investigation were willing to share a photo taken by their Honorary Member Hannah Redden. 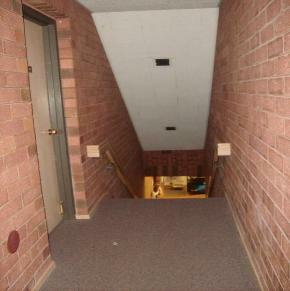 The photo was taken at the stairs that lead to the upper floor of the library building. 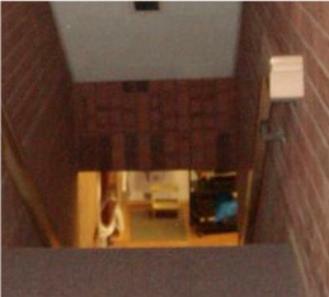 As you will see, it is taken from the top of the stairs looking down. To the left there seems to be something, but we are not sure what. There were no persons reportedly on the stairs at the time. In the second photo you will see a mist to the lower right. It is unknown what this might be. When the photo was taken no reports of a mist were made. At first glance you might think it is a reflection on the television setting in the Gallery below, but this is not thought to be true. What are your thoughts on the photos? Do you see something we have not? Let me know. We would love to hear what others make of the photos. Special thanks to Hannah Redden and Paula Birrell for sharing the photos with us. This was sent to me by an online subscription to “Library Links of the Day”. The motive of this creation was to draw attention to libraries and budget cuts. All libraries are facing money issues and changes. We are no exception. Special thanks to ImprovEverywhere and the NYC Public Library. Since libraries and ghosts are two of my favorite things I thought I would share this hilarious clip with you.